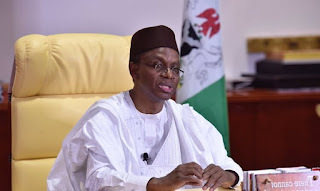 Nasir el-Rufai, governor of Kaduna state, says the N3.5 million the federal government spends every month to feed Ibrahim El-Zakzaky, leader of the Islamic Movement in Nigeria (IMN), also covers the security around him. Last week, Lai Mohammed, minister of information, had said the federal government spends N3.5 million every month to feed El-Zakzaky. The statement had generated a controversy, with many accusing the minister of making a false claim. But speaking when he received the management team of The Sun Newspaper in Kaduna on Thursday, the governor said the amount covered the cost of feeding those around Zakzaky. He said the Shi’ite leader was not detained illegally but held in custody as ordered by the court. “The N3.5 million monthly feeding on El-Zakzaky is not only about his food, but other expenses on security men attached to him. The security men are permanently stationed with him, they surrounded where he is kept,” el-Rufai said. El-Zakzaky was arrested in 2015, following a confrontation between his group and soldiers in the entourage of Tukur Buratai, the chief of army staff. Despite the bail granted to him by different court, he has been in custody.